This story is dedicated to a particular ancestor of mine James Rice Cassidy and his wife Lillian Clare. He was my father's uncle (grandfather's brother). My dad, while he was alive, often spoke about him perhaps because he was such a colourful character! James Rice Cassidy was born in Selkirk on the 25th May 1862. He was the eldest son of my great grandparent's James and Ellen Cassidy (nee Rice). In his early 20's he made the decision that working, as a plasterer alongside his dad was not for him. He left Scotland in the late 1880's and headed for England to pursue a career in the entertainment business. It was clear from the start that he was born to perform. He was a gifted comedian, character actor, vocalist and dancer. 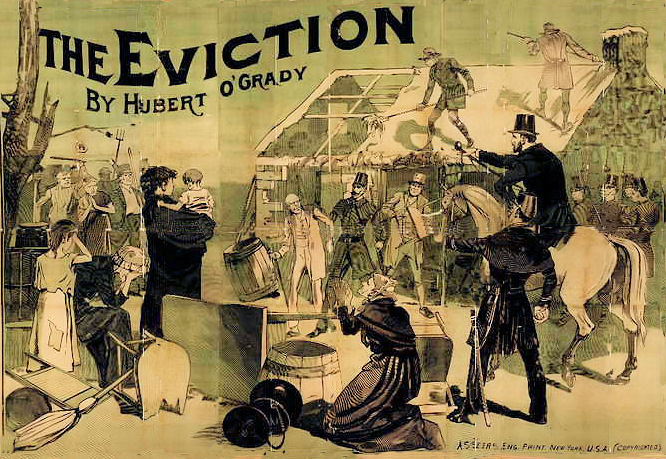 His debut as a professional actor took place in the land of his forefathers when he appeared in the play "The Eviction" at Belfast's Theatre Royal on 23rd April 1888 when he was 24 years old. The play was a great success and Cassidy went on to play the lead role of Dermot McMahon in Barnsley and Petersborough. 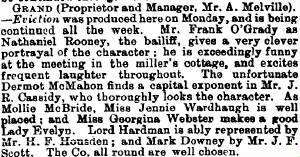 In the 1891 census he was living in Rochdale and still working as an actor. In December of 1895 he married a twenty one year old Yorkshire lass Lillian Clare Cheetham in St Anne's Church Leeds. On their marriage certificate he gave his occupation as "Comedian". 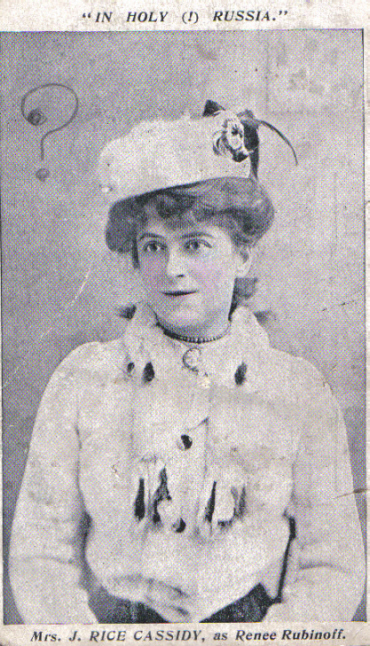 Lillian was also an actor and together they formed their own theatre company. They were a double act and she was most definitely an equal partner in the business. 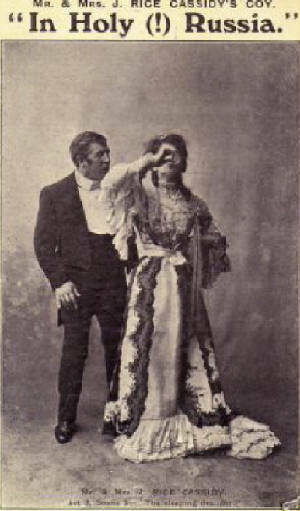 James and Lillian toured all over Britain and Ireland performing in their own productions. Their careers seemed to be going from strength to strength. Rice Cassidy was the son of a poor Irish plasterer making a name for himself in show business the classic rags to riches tale! One of their biggest successes was "The God of War" by Charles Whitlock it was performed in theatres throughout Scotland and England from 1899 till 1909. The play was a satirical piece about the Cuban insurrection and Spanish American war of 1895. His character was Dandy Donovan an Irish American servant to Dolly Daly an American heiress, played of course by Lillian. In the play he sings his own composition called “The British Hero”. The Glasgow Evening Times 7th of April 1901 referred to it as a “Sensational Cuban American Drama”. In 1909 The God of War played to a packed house at the Metropole Theatre in Stockwell Street. 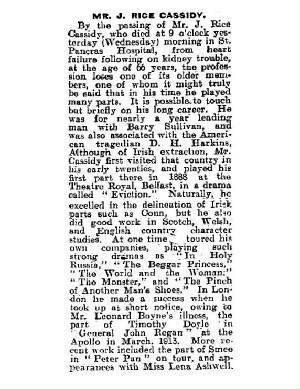 The Glasgow Evening TImes on this ocassion refers to him as the "Famous Rollicking Racy Irish Comedian". "On Saturday 23rd of October 1909 it was standing room only at the Metropole Theatre in Stockwell Street Glasgow". The Evening Times goes on to say that the Tuesday night performance was, "An all round excellent production. Mr J Rice Cassidy's ditties and antics cause an abundance of merriment and he proves himself all over an excellent actor! The piece is splendidly staged." 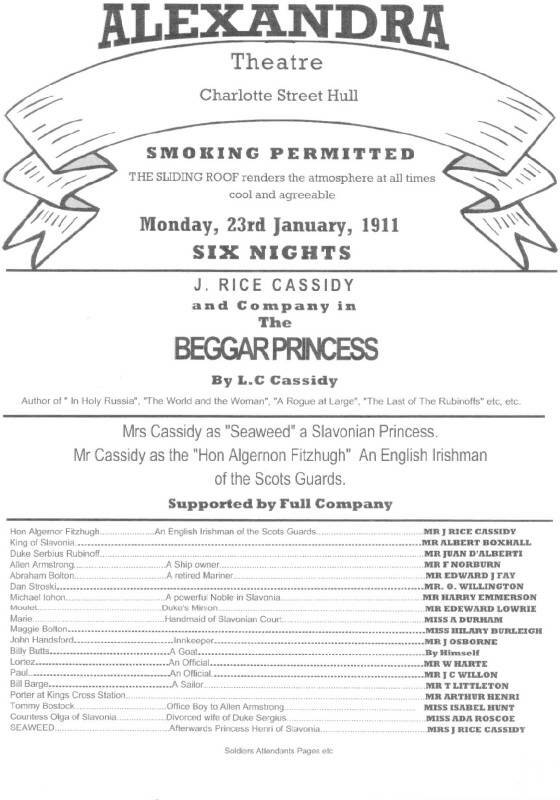 "On Monday night Mr J.R. Cassidy and Company opened a six night engagement at the Greenock Theatre Royal with what is described as the romantic Cuban-American Drama, entitled The God of War" This drama as its description denotes, deals with the Cuban insurrection and is well portrayed by a strong company of capable artistes. Mr Cassidy himself takes the part of Dandy Donovan and his eccentricities met with much approval by a good house. 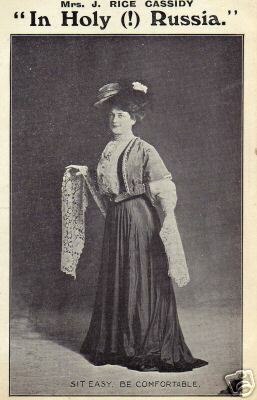 Miss Lillian Clare as Dolly Daly, is also an excellent conception and these with the others assist to form a good nights entertainment." The playbill below pertains to this highly successful production of "The God of War" performed at the Theatre Royal Greenock. James and Lillian never stopped working and they often toured with two or three productions at a time which must have been utterly exhausting. Another of their successful plays, this one was actually written by Lillian, is outlined below. New animated pictures on the Bioscope. The Princess Theatre was orignally called Her Majesty's Theatre and was opened by Queen Victoria in 1878. The name change took place in 1880. The full title was the Royal Princess Theatre and it was situated at 121 Main Street Gorbals in the South Side of the City. Up until 1945 it was owned and run by Harry McElvie he offered it to James Bridie to house his Citizens' Company and from then on it became known as the Citzens Theatre. In Rice Cassidy's time it was was well known for its productions of plays, melodramas and pantomimes. In 1906 just a few months before one of the first performances of "In Holy (!) Russia" the capacity of the theatre was 1439 seated and 162 standing. Since Cassidy's usually played to full houses this was quite an audience! The Glasgow Evening Times of Tuesday 9th April had this to say about "In Holy (!) Russia". "Mr J Rice Cassidy's company presents the thrillling Russian Drama at the South Side House this week. The attractive title would no doubt be responsible to a great extent for the large audience which filled the theatre last night. Expectations ran high and they were fully justified by the many exciting incidents in which the piece abounds. The story deals with the life of a young Russian lady who makes her escape from the Russian soldiery on her way to Siberia in company with her father and mother. She proceeds to Paris where she falls in with a band of Nihilists, who send her back to St Petersburg on private business. The journey to the capital affords room for many amusing incidents as the lady is without a passport and has to pass herself off as the wife of a gentleman travelling in the same direction. In St Petersburg thrilling scenes are enacted, her last exploit being an attempt to blow up the Czar. However all ends most satisfactorily. As "Renee Rubinoff" in her dual role of Nihilist and charming American Mrs J Rice Cassidy is most successful. Mr Arthur Stratton as "Colonel Richard Forrest" is well worth a note of praise, the acting of his part being all that could be desired. Mr J Rice Cassidy as "Micky Nolan" is also good, his humourous interludes being most warmly appreciated by the audience. The other parts are all in the hands of capable artistes. All over the piece is well worth a visit and the company should have a successful run while in the city. 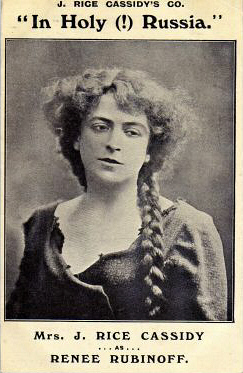 The Beggar Princess was first performed in 1910 and was an original play written again by Lillian. Rice Cassidy is the Right Honourable Algernon Fitzhugh an English Irishman of the Scot's Guards and Lillian is Seaweed who eventually becomes Princess Henri of Slavonia! Lillian was quite a prolific playwright and as with The Beggar Princess, The Last of the Rubinoffs and In Holy Russia, His Mother's Cross was an original play written by Lillian and performed in the Apollo Theatre London as well as the Hudson Theatre in Broadway New York. In this piece Rice Cassidy plays a Parish Priest Father Meary and Lillian is the daughter of Dermot Sullivan played by Mr J. K Walton and described as an "agitator"
Author of "In Holy (!) Russia", "The Beggar Princess", "The Last of the Rubinoffs" and "A Rogue at Large". Act 2 Scene 2 - - - - - - - - - - - - Reception Room Moss Anthol's House. Trial of Ned Quillet. "Yes the prisoner is guilty of infidelity but not of murder". Act 4 - - - - - - - - - - - - - - - - - - Moss Anthol's House. Theatre Royal Leeds, Apollo Theatre London and the Hudson Theatre Broadway New York. James and Lillian arrived in New York on the 17th August 1913. They gave their destination on the S.S St Pauls passenger manifest as The Players Club, 16 Gramercy Park, New York . Founded by the famous American Shakespearian actor Edwin Booth the Player's was an exculsive club where actors could relax and mingle with the great and the good! In London Rice Cassidy had made a success of playing the part of Timothy Boyle from the George A Birmingham play General John Regan. Initially it was only intended that he replace the actor Mr Leonard Boyne who had been taken ill but this became a full time role for James. 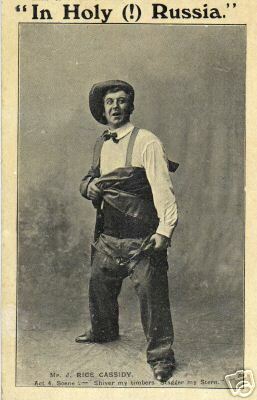 He went on to play the character at the Hudson and Liberty Theatres, Broadway, New York. This was a comedy play written by George A Birmingham. Dr. O'Grady, general practitioner of a small Irish village had convinced a visiting American newspaper publisher that a resident of the village was General John Regan, liberator of Bolivia. This harmless prank mushrooms into a major headache when the American spreads this so called fact to the rest of the world. On his return from the USA he played Conn in the Shaughraun. The play is about a Fenian fugitive, Robert Ffolliott, fiancee of Arte O'Neil. A country squire, Kinchela, his rival for Arte's hand, tries to hunt Robert down and arrest him, with the help of a police informer, Harvey Duff. Robert escapes various melodramatic cliff-hanger situations with the help of Conn the Shaughran, an Irish word which in English means wanderer or errant person. The character of Conn a roguish but comedic poacher was tailor made for Cassidy. He was a contemporary of J.M. Barrie and his plays were performed in the same theatres as those of the famous Scottish Playwright. I do not know if he ever met the man himself but Cassidy toured with Barrie's Peter Pan for three years from 1922 till 1925. He played Smee with much verve and in his own indomitable fashion. The picture above is of a playbill from the Lyceum Theatre in Edinburgh dated Monday 25th February 1924. Maisie Darrell as Peter, Lionel Gadsden as Captain Hook, Marquerite Moreton as Wendy and as you can see Rice Cassidy played Smee, Captain Hook's right hand man. 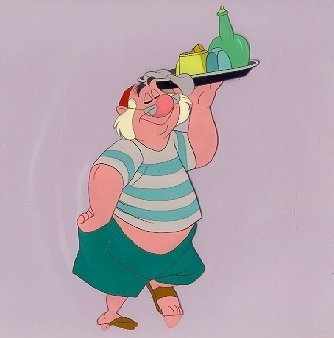 Smee is a comic character, a bumbling fool, played as an Irishman by the role's creator, George Shelton. So again it was the perfect role for Cassidy who in his long career had already proved himself to be a brilliant comic actor. James would probably carried on playing Smee but for an accident that happened just after midnight on the 25th of March 1925 while travelling on the train from Leeds to Dublin with the Peter Pan Company. He fell from the train. The emergency chain was pulled and the train ground to a halt. James was found unconscious on the track. He was rushed to Chester Royal Infirmary suffering from fractured ribs. When he regained consciousness he could not remember anything at all about the accident. He made one more venture onto the big screen when in 1922 he took the role of Governor in the British movie "The Scarlet Letter" which starred Sybil Thorndike. Towards the end of his life he suffered from a chronic kidney condition. This took its toll and he had to give up his beloved theatrical career. Eventually he suffered cardiac failure and passed away on the 11th May 1927 in St Pancreas hospital, London. His long and distinguished career merited his obituaries in both the “Stage” and “Variety” newspapers as well as a mention in both the “Who’s who” of both the British and American theatres. After thirty two years of marriage Lillian found herself very much alone. They had never been separated in all that time so her devastation at her husband’s passing must have been total. She tried to carry on with her acting and playwrighting career but eventually returned to her native Huddersfield where she lived with her brother James for a while. In April of 1930 she was admitted to Deanhouse institution, which was basically a workhouse with an infirmary attached. She was suffering from confusional insanity and obviously her brother could no longer cope with her condition. The illness was chronic and it appears she was suffering from manic depression as she would have periods of elation and then suddenly become very morose and depressed. She also suffered from hallucinations in which a lover would appear to her disguised as a bird. She was transferred to Storthes Hall Psychiatric Hospital in June the same year and was to spend the last fourteen years of her life there. 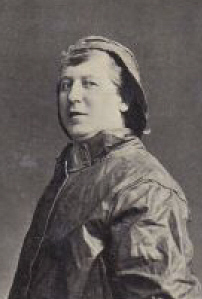 She was visited from time to time by her sister-in-law Martha Cheetham (James's widow) and her niece Florence Sheard. She was also supported financially by James Calvert Wilson her step brother. Lillian never regained her sanity. However she was often described by medical and nursing staff as having delusions of grandeur believing herself to be a famous actress and playwright. Although her imagined status became more and more fanciful as her illness progressed, nevertheless she was, in her time, a very successful, well respected writer and entertainer loved by her peers and the public alike. As well as her mental illness she was also plagued with physical ill health. After a serious of accidents resulting in various fractures she was diagnosed with osteoporosis, which is often referred to as a softening of the bones. This dreadful illness left her with little or no mobility and she was confined to bed. Towards the end of her life she must have suffered great torment both physical and mental. Lillian died on the 2nd of December 1944 in Storthes Hall, Psychiatric Hospital, Huddersfield. All that was left in possession that gave some clue to her previous existence were her fur cape, a gold ring and her costume coat. She also had some sketches and paintings. Such a sad and tragic end to the life of a very colourful and gifted lady. I have a few playbills and the images above are from postcards depicting scenes from their production of "In Holy (!) Russia". However I am always on the lookout for more information so if there are any collectors out there who can help I would be most grateful. There was a family story that James and Lillian performed with some members of Jimmy Logan’s family and they certainly would have been a contemporaries of Jimmy’s auntie Ella. James and Lillian had no children but Lillian's niece may have descendents and if someone related to the Cheetham's or the Sheard family does come across this site I would be more than delighted to hear from you.